Long's Peak, Colorado, 14,255 ft. This was to be Frank and Joseph Duncan's first fourteener. I was their guide, with two successful summits (out of three attempts) here. On Aug. 4, 1995 I made my first attempt. I was able to climb only as far as the Keyhole at 13,150 ft. 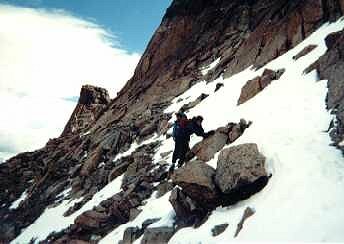 The route from there to the summit was covered in snow, and a climber coming down said you really needed an ice axe. Besides, I had just flown from sea level a day earlier and had a bad altitude headache. I was training for the Leadville 100, which I later finished in 29:49. 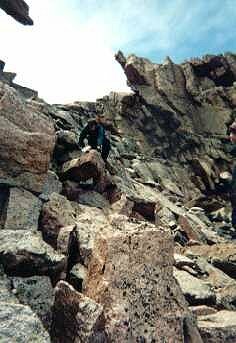 On Aug. 21, 1996 I successfully reached the summit via the Keyhole route, the easiest route to the summit (class 3), and the one I would take Frank and Joseph up. Snow levels were normal this time, which means it had all melted by August. The round trip time was 9 and a half hours. I squeezed the climb in on a Wednesday between the Pikes Peak ascent and marathon (4:29 on Sat. 6:30 on Sun. ), and the Leadville 100 (29:47 the following Saturday). 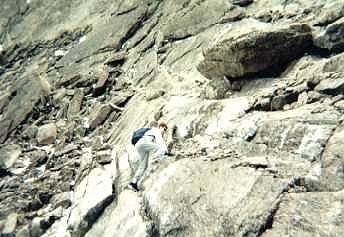 On Aug. 12, 1997 I again reached the summit via the north face, after first climbing from Chasm Lake over Mt. Lady Washington. The north face used to be called the cable route, until they removed the cables to restore the mountain to its natural state. This was a steep, difficult climb, and it started snowing on the way up. I thought the route would be too difficult to descend safely, so I traversed the summit and took the Keyhole route down. Unfortunately I was exposed to strong winds on the other side in addition to the snow, and my hands became numb in the hour long descent to the keyhole. When I descended further into better weather, the feeling returned except in four fingertips, which remained numb for 8 more weeks. 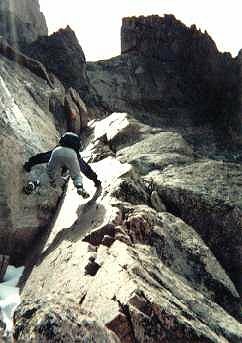 I later learned that the north face is class 5.4, meaning it was stupid for me to climb it alone without ropes or protection, even in good weather. The climb took 10 hours round trip. That climb was an experiment in altitude acclimation. 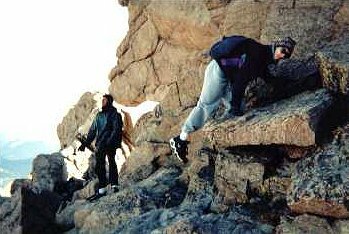 I made the climb one day after flying from sea level, and did not experience any altitude sickness. However I had made an earlier trip to Colorado in an unsuccessful attempt at the Hardrock 100 and was at high altitude from June 30 to July 25. Unfortunately I had not reacclimated well enough 4 days later to finish the Leadville 100. I had breathing problems on 12,600 ft. Hope Pass (40-60 miles) and missed a cutoff at 70 miles. June 27, 2000. Snow levels are low, so the Keyhole route is accessible early this year. 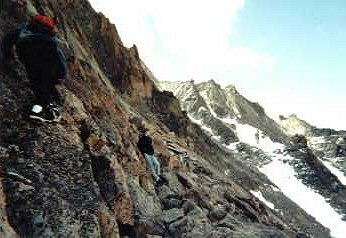 I have been at altitude 6 days and well acclimated, after climbing Bierstadt, Democrat, Princeton, Yale, and Antero (training for Nolan's 14). Ten days later, I would have my second successful finish at Hardrock. But Long's would be another story. 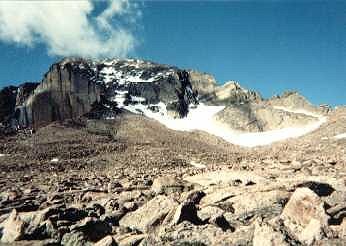 Long's Peak from the Boulder Field. Up to here, the climb is on good trail from 9600 ft. From here, we go through the Keyhole at the far right of the ridge and traverse around the back side to the summit on the left. The north face route would go directly up to the summit, just above the Diamond, the vertical wall to the left. Of course, some people go straight up the Diamond, but I insisted that the Keyhole route would be challenging enough. 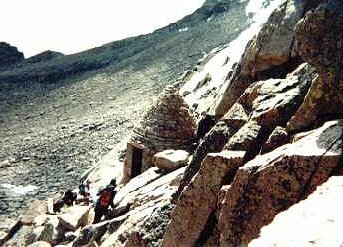 At the Keyhole is a stone hut built in memory of two of the many climbers who died on this mountain. Frank and Joseph climb through the Keyhole. From here, the climbing gets serious. Appraching the Trough, where it starts to get steep. Joseph climbs the Trough, 600 feet at a 45 degree angle. Some of the rocks were slick with ice. 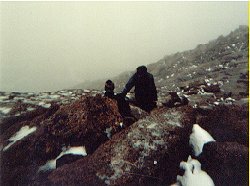 As we climbed, a snowstorm approached. 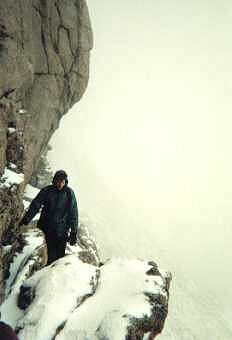 Traversing the "Narrows" in a snowstorm. Climbers ahead of us had abandoned their attempt on the summit and passed us going down. 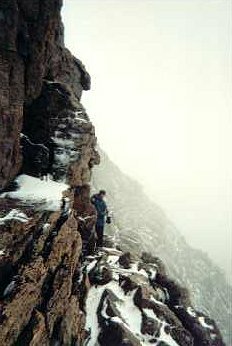 On the "Homestretch", 100 feet below the summit, we continued upwards, hoping that the pounding snow and sleet would soon stop. It did not. Two lightning bolts struck the summit within two minutes. On the second bolt, the flash and explosion were simultaneous, with a static discharge sensation through the top of my hat. "We could turn around here and go back if you want", I said. It was unanimous. Joseph descending the Narrows, now covered with 2 inches of fresh powder and still falling. The storm passed. Frank descends from the Keyhole. From here the rest is easy. After 10 hours, we are done.